Whether you regularly write a blog or own and operate a business, you may have heard about FourSquare. But do you know what it is? 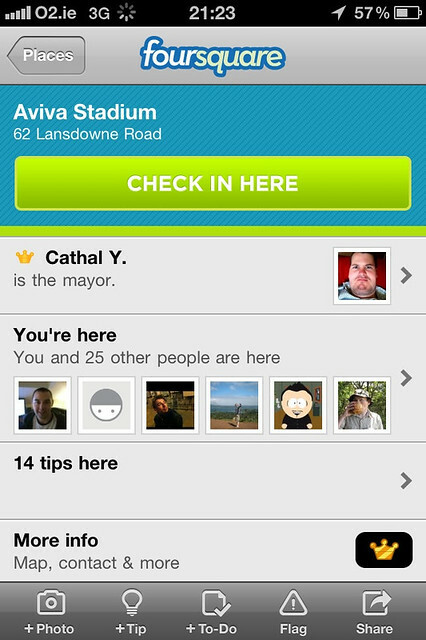 FourSquare is a social networking website that is typically used by mobile devices, such as tablets and smartphones. The location-based website is a tool that you may want to use to promote yourself or your business, or to bring new clients through your front door. Badges are just one way that FourSquare attempts to entice users to “check in” at a specific location, and these little rewards play in to the site’s biggest draw: competition. Visitors to FourSquare can try to collect more or different badges than their friends and even try to get high scores by checking in to more, new or special locations. Friendly competition like what is provided with FourSquare can garner your Twitter feed and Facebook page–and consequently, your blog or website–additional traffic as others attempt to compete with you for badges, high scores and Mayorship. A simple “check in” that takes very little time and no money to you can build your individual brand recognition. As a business, you may use the same tactics as the individual blogger or website manager and “check in” at various locations to draw attention to your company Facebook page or Twitter account, but for brick and mortar companies, FourSquare can be an invaluable tool. You can have badges created for your business, allow visitors “checking in” to earn special deals or discounts, and utilize the Mayorship title to encourage others to visit daily. While FourSquare users are busy trying to check in to the site and compete for points, you bring these would-be customers into your store, educate them about your business and potentially win a new, dedicated group of clients. As people increasingly go mobile, websites that make it fun to share are garnering more traffic. With this trend, most businesses would be remiss to not have a presence on FourSquare. Ascent Internet, a St. George, Utah Web marketing company that also provides Web development services contributed this post. Connect with them at www.ascentinternet.com.